SALVATION ARMY CEMETARY, CAT HILLS BAY ROBERTS, NF. BATTEN JOHN R . 1865 1951 Annie S.
BATTEN ANNIE S. 1877 1960 John R.
BROWN LYDIA July 26, 1895 January 9, 1997 Age 101 Yrs. Edward A. BROWN MYRA September, 24, 1911 March 17, 1999 Daughter of Thomas & Jule Brown , Sister to Edward A.
CAVE GEORGE B. 1927 1998 Age 70 Yrs. CAVE JOHN C. May 23, 1954 Age 57 Yrs. Seaman, R. N.
DUGGAN EVELYN June 1, 1972 Age 52 Yrs. GAINES MILDRED February 12, 1937 Age 22 Yrs. MERCER MARGARET February 5, 1917 Age 38 Yrs. 1st. Wife of Samuel E.
MERCER ELLEN September 1, 1950 Age 68 Yrs. 2nd. Wife of Samuel E.
MERCER ISAAC February 10, 1898 Age 30 Yrs. MERCER MARY JANE October 22, 1921 Age 74 Yrs. ????? WILLIAM January 11, 1922 Age 88 Yrs. MUGFORD MARY ANN December 28, 1946 Age 86 Yrs. MOORE JOHN March 12, 1941 Age 82 Yrs. RUSSELL MELLICIENT PAUL 1925 1992 Age 67 Yrs. RUSSELL MARGARET BRADBURY 1825 1921 Edward Age 96 Yrs. RUSSELL ALPHEUS 1909 1984 S. A. Brig. RUSSELL STELLA B. 1917 2001 S. A. Brig. SNOW HENRY C. November 13, 1938 Age 67 Yrs. SNOW SUSANNA May 2?, 1919 Age 38 Yrs. Henry C. 1st. Wife of Henry C.
SNOW SUSIE F. November 3, 1944 Age 20 Yrs. SPARKES WILLIAM March 11, 1912 Age 64 Yrs. WELSH STEPHEN June 17, 1956 Age 69 Yrs. YETMAN PEARL September 23, 1964 Age 64 Yrs. YETMAN JOHN E. June 5, 1942 Age 47 Yrs. YETMAN GEORGE October 18, 1970 Age 69 Yrs. The Cat Hills is located north , off the Conception Bay Highway in the town of Bay Roberts. 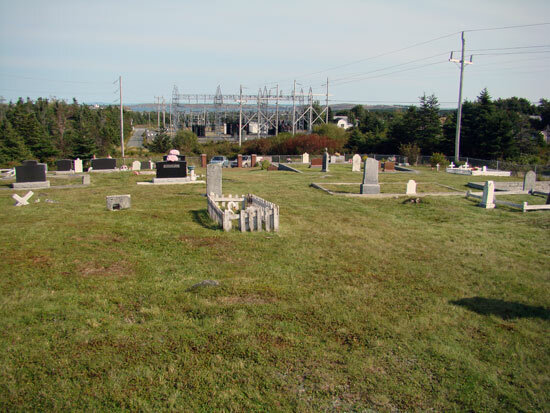 The cemetary is situated between Bay Roberts and Shearstown. Cat Hills Road is but one link to both these communities.